Senic launched in 2013 and participated with their first product, a led-based measuring tape, at YCombinator. Due to the measuring tape’s low success, they ceased its production and crowdfunded 500.000 Euros for the Nuimo. The Nuimo is a physical smart home controller in the form and size of an ice hockey puck with touch and gesture control for the command of connected smart home devices. For me, the Nuimo is a classical example of The decentralization of the smartphone through hardware. The controller costs 199€, and although a new product was scheduled for the end of 2016, the Nuimo is still the company’s only product. Without knowing the reason for the delay (or cancellation), I consider this unkept promise a red flag. Especially as I take the view that (early) product line extension is a necessity for startups. When looking at Nuimo, it’s important to consider two aspects. Firstly, will their product category (haptic smart home controls) prevail? Secondly – the obvious question – will Senic stand the test of time? Voice or voice-based apps: Amazon Echo, Google Home, Siri, etc. will play a major part. Predictive control: E.g., a Nest thermostat that adjusts the temperature based on its owner’s preferences. Such algorithms will take the necessary adjustments in our homes when we cannot or do not want to interfere. Physical remotes: Nuimo, Logitech Pop, Flic, etc. Everything that isn’t automated or controlled via voice will be handled via physical devices. Touch-based apps: Product-specific (e.g., Philips’ app for its HUEs) or general apps (e.g., iOS Home) will be of greatest use for commanding when out of home. In addition to the insignificant role physical remotes might play in the future, I am skeptical about Senic’s success due to the yet to be established ecosystem and Senic’s too early focus on premium features. We are still at a very early stage of the smart home market. This means that there is only a small fraction of people interested in smart homes in the first place. In addition to that, it is fair to assume that of that group, a yet smaller portion is looking for a smart home controller. 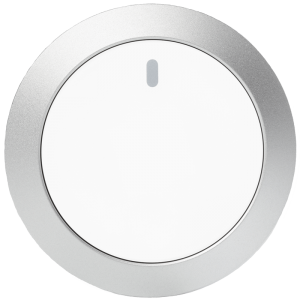 Furthermore, of those early adopters looking for a smart home remote, only a few are looking for a premium solution. Whereas the need for a dedicated smart home controller will increase (along with the growth of the whole smart home market), I believe that high-end premium remotes will play a small role. In addition to that, I dare to say that even in the future Nuimo’s premium features will be mostly irrelevant and rendered useless due to its high price. In regards to other physical remotes, Senic’s Nuimo differentiates based on design, usability and “locality” (Senic prides itself in being “Made in Germany”) and is well positioned along these features. Nevertheless, this differentiation is problematic due to two reasons. Firstly, the Nuimo is comparatively expensive. Secondly, Senic is trying to create delight but is neglecting pain reduction. Nuimo’s price makes the above-mentioned differentiation (design, usability and “locality”) useless because cheaper alternatives have more features, like, for example, the Flic ($34.99). With the Nuimo Senic is trying to create delight (make smart home controlling “more awesome” through design and the German-based production) whereas consumers are still waiting for pain reduction (make smart home controlling easier). [footnote]An analogy is Starbucks; Starbucks took something that solves pain for customers (drinking coffee solves the “pain” of tiredness) and made it “more awesome” through atmosphere, taste, etc. [footnote]Due to this, they are highly vulnerable to “commodity-competitors” like the Flic.